Gardening with birds in mind! Song Sparrows are found throughout the United States and into Southern Canada. To bring them into your garden, plant thick, low vegetation, or create a brush pile. This sparrow is celebrated - and named - for its singing. Without its melodious song, this furtive bird could be overlooked, since it stays low, often hiding in brambles or piles of brush. 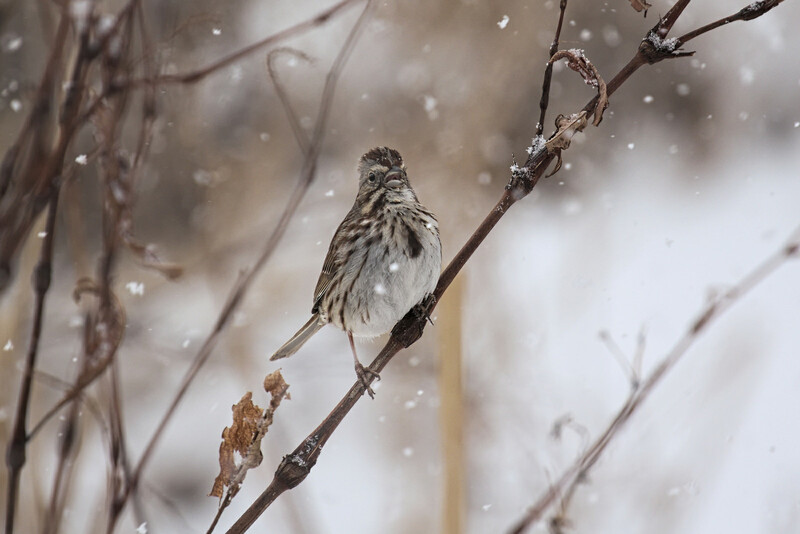 Visit the Macaulay Library and listen to more songs of the Song Sparrow! These clear, spring notes belong to a bird celebrated for its singing - the Song Sparrow. Without that melodious song, this skulking bird could be overlooked, since it stays low, often hiding in brambles or piles of brush. And it nests on or near the ground. When the Song Sparrow pops up on top of a tangle of branches to offer its cheery song, you’ll see a dull brown bird. At first glance, this sparrow seems a perfect example of an “LBB” or Little Brown Bird. But look closely: gray stripes adorn its rusty-brown head. The pale breast is streaked heavily with brown, often coalescing into a central spot. Song Sparrows frequently twitch their tails up and down, even when flying low across a clearing. This widespread songster is found throughout the United States and into Southern Canada. If you’d like to bring them into your garden, plant thick, low vegetation, or create a brush pile. Then this lovely sound may fill your day, since the Song Sparrow utters its serenade morning, noon, and evening. You can send this show to a friend! Begin at BirdNote.org. Or share it on Facebook. Search for "BirdNote," all one word. And thanks! I'm Mary McCann. Bird sounds provided by The Macaulay Library of Natural Sounds at the Cornell Lab of Ornithology, Ithaca, New York. Song of the Song Sparrow recorded by G.A. Keller. 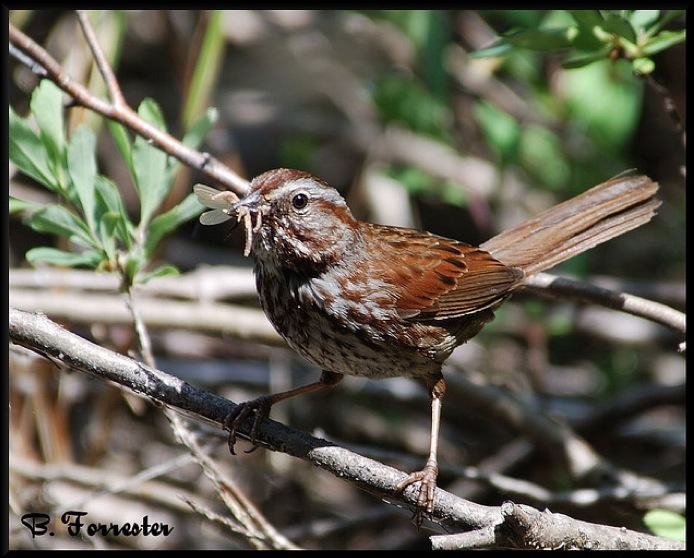 Song Sparrows are territorial -- Check out this study! 5 Things to Do for Birds in the Autumn – And One Thing for Yourself! Autumn ... Feels like a new year.